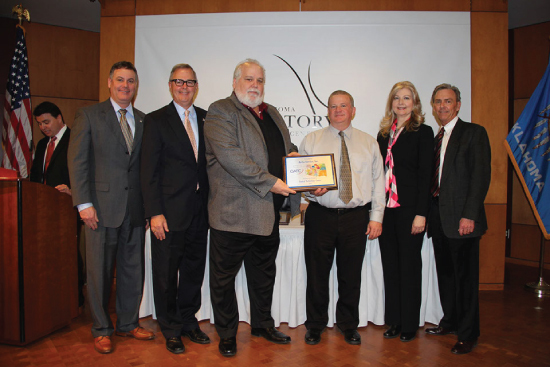 AirCo Service, Inc. was recognized as the 2015 Central Tech Partner for Progress at the Oklahoma History Center in Oklahoma City on February 19. John Boyce, CEO/Owner of AirCo Service, Inc., has committed himself and his company to supporting the Oklahoma CareerTech system. His impact and support can be seen through his involvement on the Central Tech Heating Ventilation Air Conditioning (HVAC) advisory committee. AirCo has assisted the Oklahoma HVAC industry and Oklahoma CareerTech system by hiring countless technology center graduates from across the state. AirCo has also donated thousands of dollars in equipment to Central Tech and other technology centers as well as provided feedback in the development and implementation of HVAC programs across the state, including Central Tech’s program. “When Central Tech started planning the new HVAC program in Sapulpa, Boyce was instrumental in making equipment and curriculum recommendations and providing feedback on how to start the program and prepare students for the workforce,” said Kim Howard, Sapulpa campus director. In addition to his dedication and commitment to the Central Tech HVAC program, AirCo utilizes Central Tech’s Business and Industry Services for employee safety-training. Central Tech is proud to have AirCo Service Inc. as a Partner for Progress, and congratulates them on this award. For more information on Central Tech’s buisness and industry services, visit CentralTechBIS.com. To learn more about the Central Tech HVAC program, visit CentralTech.Edu. AirCo Service Inc. was named Central Tech’s Partner for Progress and was honored at the Oklahoma History Center in Oklahoma City on February 19. (L-R) Representative James Leewright, Senator Brian Bingman, AirCo Service, Inc. CEO John Boyce, Central Tech’s Curt Nevins, Diana Plummer, and Superintendent Phil Waul. Where Did I Find Central Tech Students This Week?